Healthcare marketing disruption featuring CVS Health, Amazon, et al. Interesting article on drugstorenews.com – CVS Health won’t give Amazon leeway in healthcare. Another week, another re-write of the changing tides in healthcare marketing landscape wars. According to Larry Merlo, CVS Health’s CEO – ” CVS isn’t lying awake at night worrying about Amazon.” Who back in January bought its way into the prescription drug delivery business with a $1 billion acquisition of online pharmacy company PillPack. Merlo’s top priority is “ensuring that CVS meets the needs of its customers. The company plans to accomplish this by continuing to listen to its customers and filling any unmet needs.” With no intention of leaving any room for disruption (speaks the disruptor). This comes at a time when CVS Health is on its way to closing its $69 billion deal to acquire health insurer Aetna. The merger creates a goliath healthcare company with annual revenues second only to Walmart in the U.S. The combined entity will include Aetna’s 44.7 million members who will be able to access basically 10,000 new front doors to the health care system (9,700 retail pharmacy locations – including roughly 1,100 MinuteClinic’s). These doors will turn CVS Pharmacy locations into spaces for wellness, clinical and pharmacy services, as well turning stores into a hub for answering patient questions about their conditions, prescriptions and coverage. We’ve written before about how traditional hospital marketing teams can take on these disruptors. Roll-up all of these moves and they equate to a new arena that puts the consumer at the center of health care delivery. It’s an arena that is more convenient, easier to use and less expensive for consumers. And it comes at a time when increasing numbers of consumers are taking on more responsibility for paying for their health care as the burden of costs is being shifted to them. Determine Your Advantage. Develop a candid assessment of your strengths – whether assets, market positions, reputation or capabilities. Deep analysis might reveal not so obvious areas of opportunity where the organization can also excel and create new value for both customers and physicians. Develop Intimate Consumer Understanding. As consumerism takes root, legacy health care providers must develop a more comprehensive understanding of the patients and communities they serve (as CVS, Amazon, Walgreen’s, etc. already do). Beyond just clinical data, personas should reveal a deeper understanding of patients’ routines, wishes and needs to help you better engage and anticipate their future health and healthcare needs. Stretch Your Competitive Mindset. Big growth ideas are born at the intersection of deeply understanding your advantage, your consumer and the (fast-moving) healthcare marketplace. Looking at direct competitors is necessary, but not insightful. 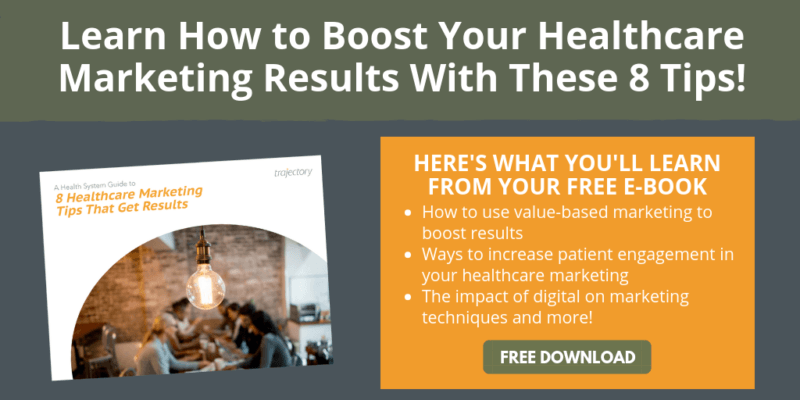 Health care marketing teams must look beyond those they most directly compete with – to experiential competitors (who might replace you) and perceptual competitors (who are changing customer expectations across categories). This is the mindset you need to make big gains. Approach Head-On What You Can Not Change. There are two undeniable shifts taking place in health care. First, care is moving away from campus-based acute care. Second, the consumerism train isn’t slowing down. If the consumer really is at the center of your universe – their convenience, their cost-savings and the quality of their experience should be front and center. How to remain their go-to resource for community health? Improve access. Disrupt your own model to deliver the best possible care and health and wellness to your communities. Ongoing Dialogue. Content should be a key element to your hospital marketing strategy. But it needs to be content that pulls people in. You should be feeding your audience content that is attention-grabbing, visual, emotional and uniquely yours (which doesn’t negate educational content for consumers seeking answers to specific health-related questions). Importantly, it should always be mobile optimized. Because about 60% of time spent on social media is through a mobile device. Since 1999, Trajectory has worked across the health + wellness continuum moving healthcare brands and businesses upward to new destinations. If your brand’s trajectory is slowing down or on the decline, reach out to us for a conversation.